– Literary meeting with Salim Jay, author of Dictionnaire des romanciers algériens (Dictionary of Algerian novelists; S. Safran 2018), and a dialogue with Hervé Sanson, co-president of the scientific comittee of SIAMD. 19 January 2019 Meura bookstore in Lille : Night of reading. 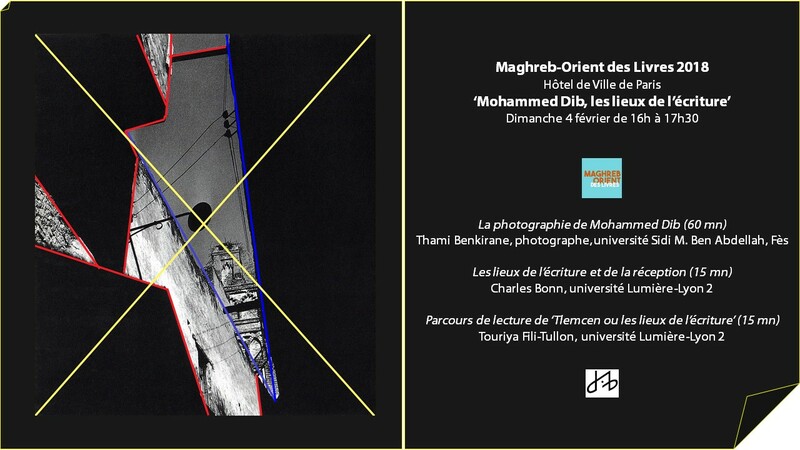 Poetical readings of Mohammed Dib’s texts and dialogue with the audience. 11 March: Mohammed Dib-day in Saint Denis. à 14h15 et à 17h30 slameur Loubaki, spectacle sur le thème « Traversée vers l’autre » se basant sur les textes de Dib. September: « Quand l’ombre passe » marionette show tribute to Mohammed Dib – creator Marja Nykänen (Cie Illusia). 11 September: Librairie les mondes magiques, Rouen. 19 September: Festival mondial des théâtres de marionnettes, Charleville -Mézières.